Update: You can now take our online video workshop from home! Want to sew with knit fabrics but don’t own an overlocker or serger? No problem! 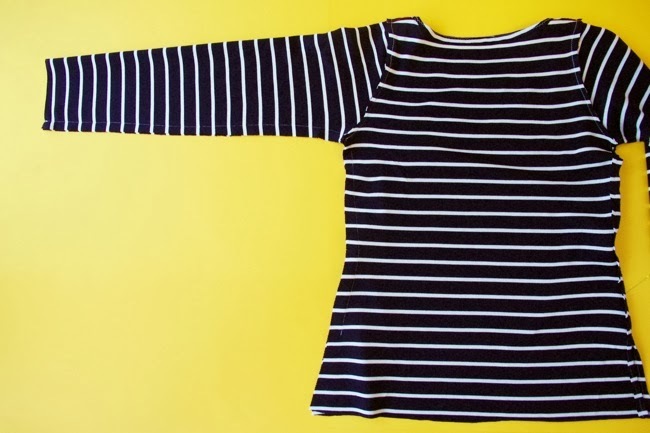 While overlockers or sergers are great for handling stretch fabrics and creating a professional-looking finish (I love mine), you don’t necessarily need one to sew with knits. 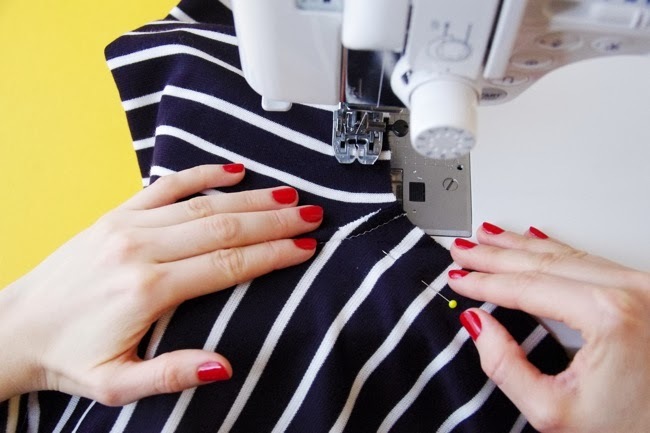 If you’ve got zigzag stitch on your regular sewing machine, you can use that instead. In fact, the instructions in the Coco sewing pattern and Agnes sewing pattern assume you are using a regular machine (but if you are lucky enough to have an overlocker or serger, go ahead and use it if you prefer!). Use a ballpoint or stretch needle in your sewing machine. Personally I find ballpoint needles work well for me - they have a slightly rounded tip which passes through the looped structure of the material without laddering it. 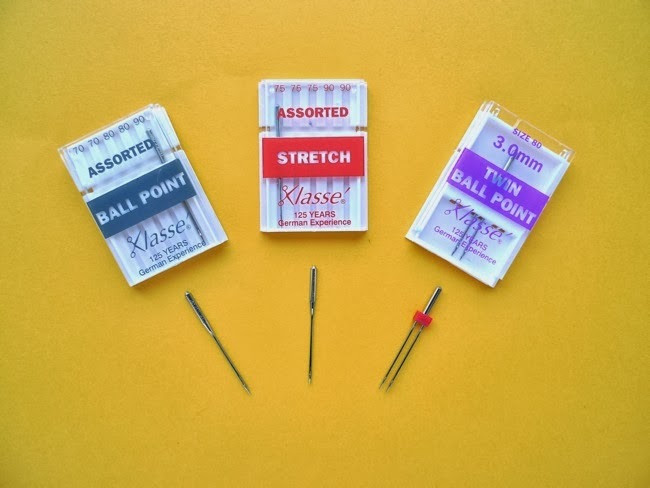 Other people swear by stretch needles, so see which works for you and the fabric you're using. If you can find ballpoint pins (I can’t! ), you may want to use them too – otherwise just take care that your pins don’t leave holes in your lovely fabric. This is totally optional, but if you want to, you could get a twin ballpoint needle for topstitching areas such as the hem, neckline or pocket. Twin needles form two rows of stitching parallel to each other a few mm apart on the right side of the fabric, and a small zigzag stitch on the wrong side. Sweet! You’ll need a second spool pin for this – your machine might already have two, or you can attach an extra one to your bobbin winder spindle. 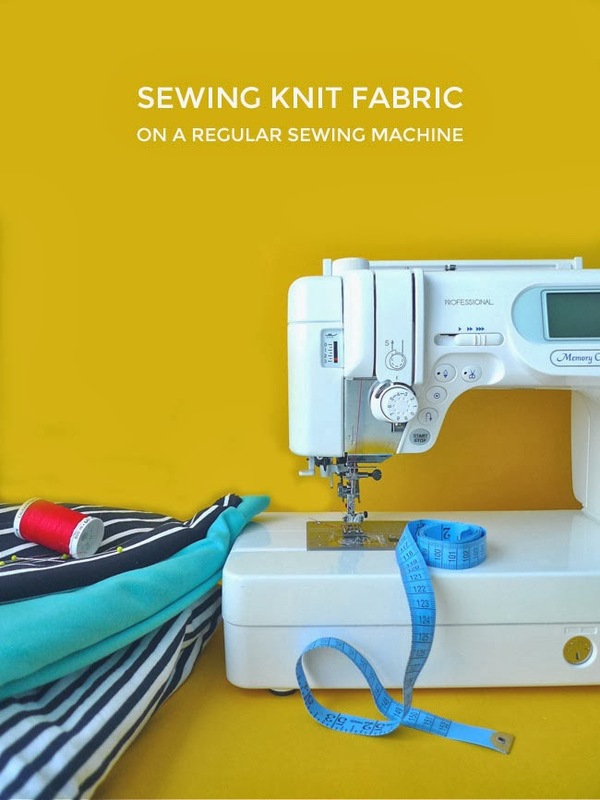 Set your sewing machine to the zigzag stitch – rather than the straight stitch – to sew horizontal seams, such as the neckline, armholes and hem. This is important firstly because the finished garment needs enough stretch so you can pull it over your body; and secondly because the horizontal grain of knit fabric can stretch out when you’re sewing it and you may find that straight stitch kinda “sets” this stretched-out-ness. Zigzag stitch isn’t so vital for vertical seams such as side seams and pockets, on which you can try using straight stitch. Before you begin, make sure the presser foot you’re using has a wide enough slot so the needle doesn’t hit it when making the zigzags. Your sewing machine manual will tell you how to change the stitch to zigzag. Your sewing machine may have a variety of zigzag-style and stretch stitches, and feel free to try them out, but I find the standard zigzag stitch works just fine. Test your zigzag stitching on a double scrap (ie. two layers) of your fabric before you begin. 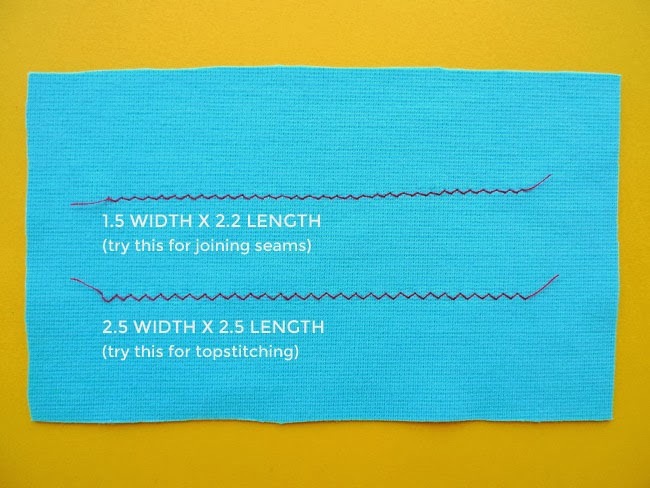 The width of the zigzag will determine how much the stitch stretches – have a play around with the length and width settings to see what works on your fabric, plus what you think looks nice. I like to use 1.5 width x 2.2 length zigzag for joining seams, 2.5 x 2.5 for a neat topstitch. Sew with the needle starting on the seam line, just as you would when using straight stitch, back tacking (reverse stitching) over either end to secure the stitching. I find that sometimes back tacking with zigzag stitch works fine, other times it looks a total mess in which case I'll back tack with straight stitch. 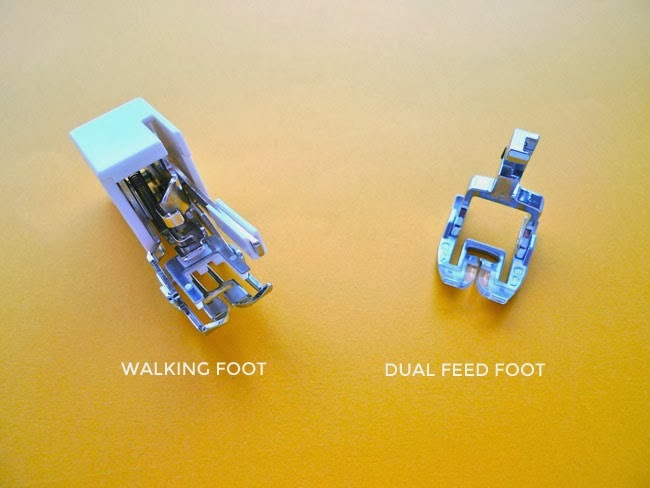 A walking foot or dual feed foot attachment for your sewing machine are useful for helping to prevent one layer of fabric from stretching out while sewing. They grip the fabric and feed both layers of fabric through the machine at the same speed. Which one you need and how you use it will depend on your model of sewing machine (I bought a walking foot for my Janome J3-18, and when I got my Janome 6600P it came with a dual feed foot) so check your manual. Also take a look in your manual to see if there’s a dial for changing the pressure of the presser foot. Reducing the presser foot pressure (now that’s a tongue twister!) can help stop the fabric stretching too much while it goes through the machine. Try not to stretch the fabric as it goes through the sewing machine. Keep the fabric in front of the machine laying flat – if your machine comes with an extension table, that can be helpful, or simply hold the fabric up slightly so it doesn’t hang off your sewing table. Take your time when sewing knits, taking pauses with the needle down so you can readjust the alignment of the raw edges of the fabric. Knits don’t usually fray, so you don’t have to finish the seams – hooray! Of course if you want to, you can tidy up the raw edges using zigzag stitch (or an overlocker or serger if you have one). As with woven fabric, pressing the seams after you’ve sewn them will help make them look much neater. And there you have it – not so difficult after all! As with so many things in life – and especially with creative endeavours – there isn’t one “right” way of doing this, so much of this is down to personal preference. So if you don’t get on with any of these tricks, don’t fret – test things out and find what works for you. If you have your own tips for sewing with knits, please do share in the comments! Want to know more? Want to see knit fabric sewing in action? Sign up for our online workshop - Learn to Sew Jersey Tops on a Regular Sewing Machine. Behind the Scenes: Studio Tour!